Specifically formulated to be used in conjunction with any brush with SCF technology, whether it is the Arctic Butterfly® or any of our Sensor Brushes®. Sensor Brush Clean™ is pH buffered to avoid extreme acidity or alkalinity so as to not affect the existing charges on the brush while safely cleaning any residual debris. 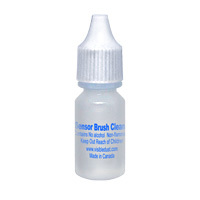 Sensor Brush Clean™ liquid (8 ml).In stock! Order now!